In 2016 the rebound of the Italian automotive sector continued, with a 8.8% production increase year-on-year, according to the International Organization of Motor Vehicle Manufacturers OICA. The surge was driven by increasing domestic demand and buyoant exports (64% of vehicles produced in 2016 were sold abroad). The rebound in domestic demand is mainly due to a modest economic recovery, coupled with low interest rates, lower fuel prices, easier access to consumer credit and appealing promotional campaigns by car manufacturers. Registrations or sales of new vehicles increased 18.8% to 2 million units, according to the European Automobile Manufacturers Association (ACEA). Growth continued in 2017, with passenger cars registrations increasing 8.1% and commercial vehicles registrations rising 7.8% year-on-year between January and May 2017. The outlook for H2 of 2017 and 2018 remains positive, as there is still future potential for sales growth of new vehicles replacing obsolete models: 47% of cars in Italy still do not meet the Euro 4 emission standards, and the average age of the vehicle fleet amounts to 10.4 years. However, despite the increase, both production and domestic sales remain below pre-crisis level (in 2008 more than 2.4 million cars were sold). The surge in production and registrations since 2014 must be seen against sharp decreases between 2009 and 2013. At the same time, the economic rebound in Italy remains modest (GDP is forecast to increase 1.1% in 2017 and 1.0% in 2018), and business and consumer sentiment is prone to setbacks due to potential political uncertainty and doubts about the stability of the financial system. 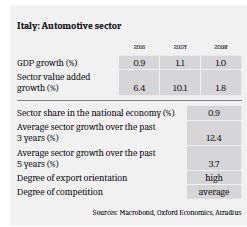 With the steep decline in car sales and production in the years before 2014, many of Italy’s manufacturers and car part suppliers recorded decreasing profit margins. Especially smaller businesses saw their equity ratios, solvency and liquidity weaken. Thanks to the recovery, the surviving supplier businesses have registered increasing profit margins, which are expected to remain stable in 2017. On average, payments in the Italian automotive industry range between 60 to 90 and 120 to 150 days, depending on the end-buyer and whether working capital requirements can be obtained from banks or suppliers. Generally, payments are quicker when the end-buyer is a foreign company. Payment experience has been satisfying over the past two years, and non-payments are not expected to increase in the coming months. 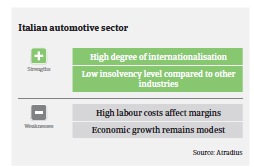 The level of automotive insolvencies is low compared to other industries, and business failures are expected to level off in 2017. 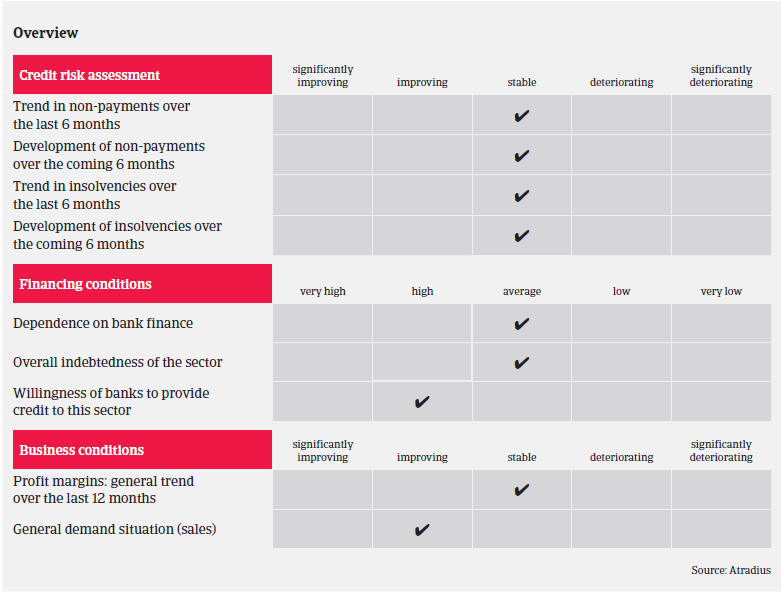 Considering the good performance of the industry in 2016 and the still favourable outlook for 2017, we have upgraded the automotive sector performance assessment from “Fair” to “Good” in early 2017. Our underwriting stance for the industry is generally open. We are more cautious with components manufacturers, who have low bargaining power against car manufacturers, and with tyre distributors/wholesalers due to increased competition and consolidation in this segment. The Italian chemicals industry continues to benefit from a rebound in domestic demand, however fiscal crimes plague the fuel wholesalers segment.